The best part of any outfit is a great smile. Keeping our teeth bright and healthy so we are always ready to beam for the camera is as important to Us as regularly updating our wardrobes, hair and nails. From activated charcoal to teeth whitening gel, we have tried so many different products for oral hygiene. We are always on the hunt for cool new ways to maintain a bright smile! 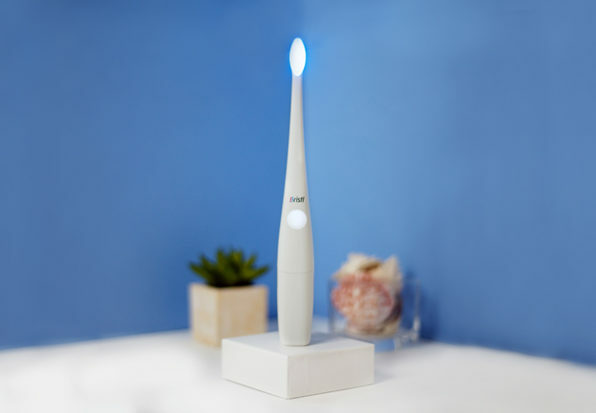 The latest teeth whitening product we are adding to our beauty and health routine is an electric toothbrush that lights up with colors that do more than just look beautiful on your bathroom counter. The Bristl Phototherapy Electric Toothbrush is designed to not only keep teeth clean but is also meant to reduce bacteria that causes gingivitis, prevents periodontitis and improves gum health. This toothbrush lights up in different colors that are actually responsible for treating our teeth and gums to a serious deep cleaning! See it: Snag the Bristl Phototherapy Electric Toothbrush (marked down 24 percent off its original $99 price, now $75) while the deal is still available on Joyus. Also get a $1 credit for every $25 spent on Joyus. So how does this gadget work? The Bristl Phototherapy Electric Toothbrush has three different light therapy modes to improve mouth health: blue, red and purple. The blue wavelength light kills oral bacteria that can cause gum disease. The same blue light also helps to whiten teeth over time with consistent use. The red wavelength light ignites collagen secretion to regenerate gum tissue, reduce inflammation and prevents gingivitis. This helps create stronger, healthier gums. 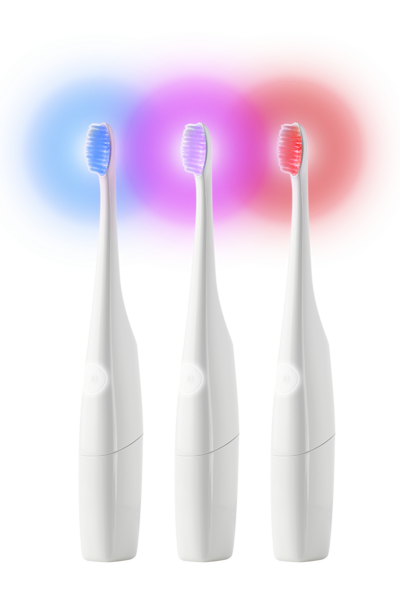 There is also a purple light option which allows the toothbrush to operate with both red and blue light functions. Simply press and hold the power button for two seconds then let go to switch the light settings. Doctors have used light therapy, also called phototherapy, to treat skin conditions like hormonal acne breakouts and psoriasis. Now this innovative technology is out to zap away the bacteria in our mouths. 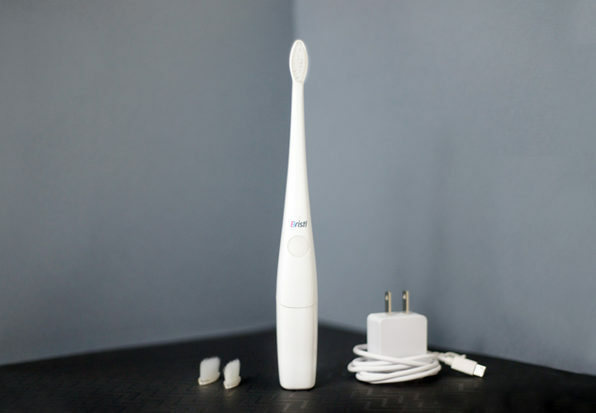 The best part is that instead of paying over $200 for light therapy products like the Zit Zapper, we can score this electric toothbrush for under $100. We love that there are two sonic vibration modes: gentle (12,000 rpm) and strong (24,000 rpm). The toothbrush is meant to tackle plaque in hard-to-reach places between teeth and gums more effectively than traditional toothbrush bristles, without irritating the gums. It also allows Us to accurately measure brush time since the device automatically turns off after two minutes of use. When we order this toothbrush, it comes with two microfiber bristles, one 3-feet long micro USB charging cable, a charging block with California level 6 certification plus a battery that lasts for three weeks when used three times each day. It also has a replaceable brush head that can be grabbed individually or through the direct Bristl subscription service that delivers a new brush head to our doors every four months. This means we never have to worry about running to the pharmacy to snag a new toothbrush every few months. This toothbrush technology was first crowdfunded on Kickstarter on March 26 with an initial goal of $10,000. The brand ended up reaching the goal within four hours of publishing the page and has since surpassed it by snagging $66,429 from 584 backers. It is incredible to watch this cool oral hygiene tool go from a well researched idea to a Kickstarter campaign to a device we can actually order, use and restock! We also love that the Bristl toothbrush was created to contribute to a greater cause! The brand partners with nonprofit organizations like The Children’s Dental Center of Greater Los Angeles which provide dental care to many disenfranchised children all over the country. For each Bristl toothbrush sold, the brand donates a percentage of the profits to those organizations so more children have access to oral health. As it goes with all beauty and hygiene products, results vary based on the unique needs of each individual. We recommend shoppers consult with their doctors before ordering to ensure the best results. Yes for preventative care that keeps Us looking and feel great about our smiles!